In addition to being the UFC’s middleweight top contender, Chael Sonnen is also the sport’s most articulate trash talker. Although every other word out of his mouth lately has been Anderson Silva-related, Sonnen claims he’s normally not one to unleash insults. “There are some guys who will get their feelings hurt here and there, but I’m not a big name caller. 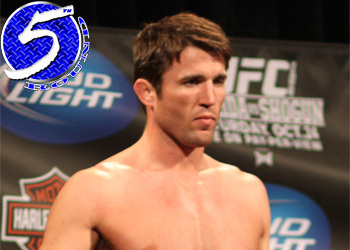 I don’t pick on guys very much,” Sonnen told UFC.com. “I’ll just point some things out and make them take a little look at themselves. Although the Team Quest trained athlete states he isn’t one to call a fighter out, Silva and his Team Black House amigos were somehow able to crack Sonnen’s VIP list. Not only did the talented squad make the exclusive club, they own all the top spots. While most peeps on this side of sanity believe he’s barking up the wrong Brazilian tree by going after MMA’s baddest 185-pounder (when he wants to be), the 33-year-old could care less because this ain’t the music industry. “I don’t know if it’s gotten me in trouble too much, and at the end of the day, this is the fight business. We aren’t fight friends,” Sonen matter-of-factly said. “This isn’t Eminem insulting 50 Cent during an interview from across the country. So anytime this gets me in trouble, the solution to the problem is very evident – it’s an eight-sided cage called the Octagon. I’ll see you there. Silva and Sonnen will be performing their collaboration live at UFC 117 on August 17th inside Oracle Arena in Oakland, California.